It's not just that New York's leaders are spineless. They're frightened, which is far more dangerous. If you haven’t been following the situation in New York City since Saturday, things are getting tense. On Saturday, a gunman shot and killed two police officers at close range in Bedford–Stuyvesant, Brooklyn. The murders come on the heels of weeks of protest in New York (and elsewhere) against the rampant lawlessness and brutality of the police. Instantly, the police and their defenders moved into high gear, blaming the murders on the protesters; New York City Mayor Bill de Blasio, who had been gesturing toward the need for police reform; and US Attorney General Eric Holder. Many have called for the mayor’s resignation. “There is blood on many hands, from those that incited violence under the guise of protest to try to tear down what police officers did every day,” Mr. Lynch said. A statement purporting to be from the Patrolmen’s Benevolent Association, the biggest police union, blamed Mr. de Blasio for the shootings. The statement instructed officers to forward it to colleagues, and it spread instantly through the department. The Sergeants Benevolent Association issued a similar statement on Twitter. I had heard that that statement was not in fact from the New York City Patrolmen’s Benevolent Association, but now I can’t find anything definitive about it. In any event, it gives you a flavor of what Greg Grandin is calling a “cop coup” in New York. It’s a strong term, but it’s hard not to conclude that the mayor believes his first duty is not to the security and well-being of the people of New York but to the security and well-being of the New York Police Department. Because the fate of his administration is in their hands. The mayor’s call came a few hours after the police commissioner, William J. Bratton, said that the killing of the officers on Saturday was a “direct spinoff of this issue” of the protests that have roiled the nation in recent weeks. And with that, de Blasio’s pretty much handed over his administration to the NYPD. Listening to these cries from the cops — of blood on people’s hands, of getting on a war footing — it’s hard not to think that a Dolchstosslegende isn’t being born. Throw in the witches brew of race and state violence that kicked it off, the nearly universal obeisance to the feelings and sensitivities of the most powerful and militarized sectors of the state, and the helplessness and haplessness of the city’s liberal voices, and you begin to get a sense of the Weimar-y vibe (and not the good kind) out there. But whatever historical precedent comes to mind, one thing is clear. 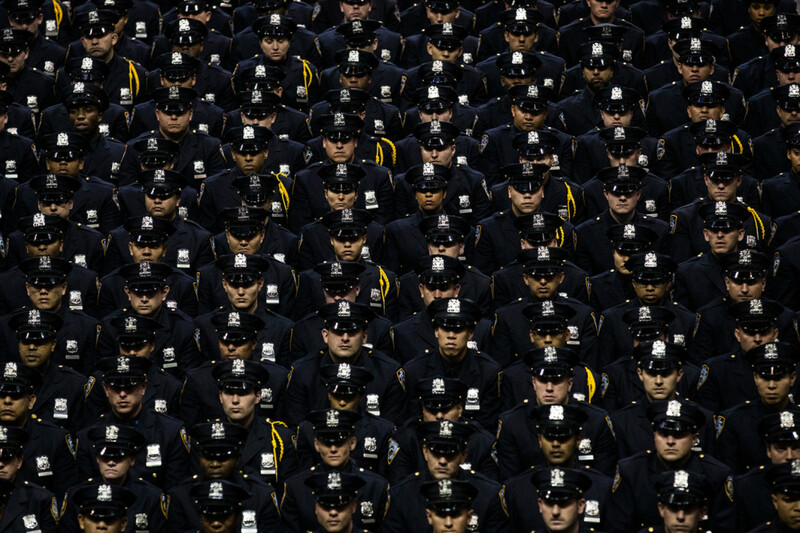 The entire New York City establishment — not just de Blasio, but political, cultural, and economic elites — is terrified (or in support) of the cops. With the exception of this fairly cautious statement from Brooklyn Borough President Eric Adams, himself a former police captain, not one of these figures has spoken out against the Freikorps-ish rhetoric emanating from the NYPD. It’s not that these men and women are spineless or gutless in a psychological or personal sense. It’s worse: They’re politically frightened, which is far more dangerous. Because they have no sense of an alternative base or source of power. After decades of being whipsawed by capital — you could trace this rot all the way back to 1975, if not even further — they’re simply not prepared to take on the police. Even if they wanted to. It’s not just that New York’s leaders are spineless. They’re frightened, which is far more dangerous.